You use your mouse in this game. You need to place the active element into the grid by clicking the left mouse button. Eventually, you will need to make compounds, which will earn you points. Every game starts off with a grid, an active element and 4 elements in line. What varies is the amount of elements left, the target and the arrangement of the different elements on the board at the start of each level. You can only play the active element. Once you have played that, the one immediately to the right of that one becomes the active element. So you must put it down somewhere. Whether it makes a compound or not, it doesn't matter. These compounds and elements get "discovered" over time, so cannot always be made. They are in order of how you unlock them. Steer clear of the unstable compound! Making this is an instant game over! Other ways to end your game would be to run out of molecules or space in the grid without meeting the target. Remember, there are only 36 squares in the grid. This means that usually all of the elements won't fit inside it. So make compounds as quickly as possible. Plan compounds in advance. Also, make sure you aim for the biggest scoring compound but have room to alter your strategy if the elements you need aren't coming up. Another tip from me would be to make "double ended" compounds. These are 2 different compounds sharing one element. For example, 1 Neopium molecule which is connected to both 2 slothites and another Neopium, or a Tyrannium and a Neopium. This way you can get whichever comes first. The game board gets cluttered more and more in the later levels, making it harder to plan compounds. Stella, a TDN viewer, adds: "from level 6 onwards, whenever the board is cleared, an additional 5 points are awarded. Also, the levels past level 6 are designed so that the board can be cleared at least once - so instead of trying to create compounds from scratch, try to use the material the game already gave you." 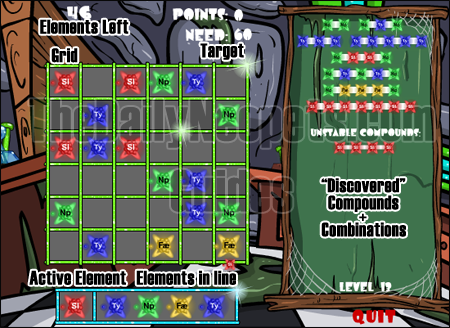 For quick Neopoints, don't think about making the biggest scoring molecule, think about clearing the board of the ones that are left there at the start of each level the quickest. That way, you'll have a fair amount of points and didn't take much time about it. But remember to plan if you're going for big Neopoints or a highscore. The Snowager is awake. He'll be sleeping in 3 hours, 49 minutes.